The Sunshine Coast, as a term recognised by most Australians, is the district defined in 1967 as "the area contained in the Shires of Landsborough, Maroochy and Noosa, but excluding Bribie Island". Its use is frequently colloquial however. Since 2014, the Sunshine Coast district has been split into two local government areas, the Sunshine Coast Region and the Shire of Noosa, which administer the southern and northern parts of the Sunshine Coast respectively. James Cook on the deck of HM Bark Endeavour in 1770 became the first known white person to sight the Glass House Mountains, located south-west of Caloundra. In the 1820s, the Sunshine Coast saw its first white inhabitants: three castaways (Finnegan, Pamphlet and Parsons) who shared the life of the local (Kabi Kabi) Aborigines for eight months. Thereafter, during the 1830s to 1840s, the district became home to numerous runaway convicts from the Moreton Bay (Brisbane) penal colony slightly to the south. In 1842, Governor George Gipps had the entire Sunshine Coast and hinterland from Mt Beerwah north to roughly Eumundi declared a "Bunya Bunya Reserve" for the protection of the bunya tree after Andrew Petrie advised him of the importance of bunya groves in Aboriginal culture. However, during the 1840s and 1850s, the Bunya Bunya Reserve and its vicinity became the scene of some of the most bitter skirmishes of Australia's "Black War". The Blackall Range, on account of the tri-annual Bunya Festival, served as both a hideout and rallying point for attacks against white settlement. By the 1850s timber cutters and cattlemen had started exploiting the area; in 1860 the Bunya Bunya Reserve was scrapped. Many of the Sunshine Coast's towns began as simple ports or jetties for the timber industry during the 1860s and 1870s, as the area once had magnificent stands of forest. Likewise, the region's roads often began as snigging tracks for hauling timber. Timbergetters used the region's creeks, rivers and lakes as seaways to float out their logs of cedar – the resultant wood being shipped as far afield as Europe. During the Gympie Gold Rush (1867), prospectors scaled the Sunshine Coast mountains to develop easier roadways to and from the gold fields of Gympie. After construction of the railway line to Gympie, the coastal and river towns, being mostly ports for the early river-trade, were bypassed. By the 1890s diverse small-farming (fruit and dairy) had replaced the cattle-and-timber economy of earlier decades. Sugar cane and pineapples proved especially important produce for the district. Many small hamlets and towns now emerged. Produce was initially taken by horse to Landsborough, then to Eudlo in 1891. Especially after World War II, the Sunshine Coast grew into a favoured holiday and surfing destination. This tendency was further expanded in the development boom of the 1960s and 1970s. Around the same time, various tourist/theme parks were created – the most iconic being the Big Pineapple in Woombye. During the 1960s and 1970s, the Sunshine Coast also attracted persons drawn to alternative lifestyles. These newcomers developed a range of craft industries, co-operatives and spiritual centres, particularly in the hinterlands. After the 1980s, the Sunshine Coast experienced rapid population growth. As of 2016[update] it had become one of the fastest-growing regions in Australia. As the region becomes increasingly residential, most of the district's distinctive small farms – especially tropical-fruit and sugar-cane farms have disappeared, as have most of its theme parks. The Moreton sugar mills closure in 2003 removed a market for the district's 120 cane growers who had been harvesting cane in the region. Instead, businesses concerned with retail, catering and tourism have assumed increasing importance. In 2008, The Shire of Noosa, Shire of Maroochy and City of Caloundra merged to form the Sunshine Coast Region. The 2007 referendum conducted by the Australian Electoral Commission and leading to the merger remained controversial in Noosa Shire, where 95% of voters had rejected amalgamation. In March 2013, a second referendum resulted in 81% of residents voted to leave the amalgamated Sunshine Coast Region. On 9 November 2013 an election resulted in Noel Playford being elected to take office as mayor on 1 January 2014 with the new council. The Shire of Noosa was re-established on 1 January 2014. This resulted in two geopolitical areas occupying the area generally recognised as 'The Sunshine Coast'. The Sunshine Coast Region, governed by the Sunshine Coast Council and the Shire of Noosa, governed by Noosa Shire Council. The Sunshine Coast is a centre for tourism, attracting more than 3.2 million visitors a year. There are significant attractions, such as Steve Irwin's Australia Zoo, UnderWater World marine park, Aussie World with the Ettamogah Pub, the Buderim Ginger Factory, the Big Pineapple, the Eumundi Markets and the Majestic Theatre, Pomona. Sports tourism is supported by several annual sporting events such as the Mooloolaba Triathlon, Noosa Triathlon and Sunshine Coast Marathon. 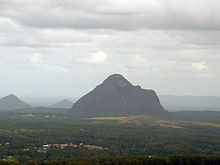 Sunshine Coast has a humid subtropical climate typical of South Queensland. Summers are generally hot, but moderated compared to areas on similar latitudes elsewhere. Winters retain warm days, but have cooler nights rendering it falling into the subtropical fold. There is no dry season and precipitation is generally quite high. The average temperature of the sea ranges from 21.2 °C (70.2 °F) in August to 27.1 °C (80.8 °F) in February at Mooloolaba, and from 21.2 °C (70.2 °F) in August to 27.3 °C (81.1 °F) in February at Noosa Heads. ^ a b c "3218.0 – Regional Population Growth, Australia, 2014–15: Population Estimates by Significant Urban Area, 2005 to 2015". Australian Bureau of Statistics. Australian Bureau of Statistics. 30 March 2016. Archived from the original on 8 September 2016. Retrieved 12 September 2016. Estimated resident population, 30 June 2015. ^ "2016 Census Quickstats: Sunshine Coast". ABS Census. Australian Bureau of Statistics. Archived from the original on 14 April 2018. Retrieved 14 April 2018. ^ "Sunshine Coast - district (entry 32861)". Queensland Place Names. Queensland Government. Retrieved 26 November 2017. ^ "Glass House Mountains National Park". Queensland Government. Archived from the original on 5 April 2011. Retrieved 12 June 2011. ^ GHD (March 2005). "Department of Natural Resources and Mines and Maroochy Shire Council" (PDF). p. 17. Archived from the original (PDF) on 25 July 2011. Retrieved 12 June 2011. ^ Henley, John R. "The first settlers of the Nambour area". Archived from the original on 8 November 2012. Retrieved 29 October 2012. ^ "Nambour – Sunshine Coast Regional Council". Archived from the original on 25 July 2011. Retrieved 12 June 2011. ^ "Buderim – Sunshine Coast Regional Council". Archived from the original on 25 July 2011. Retrieved 12 June 2011. ^ "Cotton Tree Caravan Park (entry 602707)". Queensland Heritage Register. Queensland Heritage Council. Retrieved 12 August 2015. ^ "3218.0 - Regional Population Growth, Australia, 2016: Queensland". Australian Bureau of Statistics. Archived from the original on 15 August 2017. Retrieved 1 June 2017. ^ ""Australian Electoral Commission 2007 Results of plebiscites on council amalgamations"". Archived from the original on 10 June 2016. Retrieved 25 May 2016. ^ mmackander. "Coast leads the way when it comes to visitors". Archived from the original on 18 August 2017. Retrieved 1 June 2017. ^ Sunshine Coast Marathon Archived 19 August 2012 at the Wayback Machine. Retrieved 19 July 2014. ^ "Sunshine Coast Australia.com National Parks Section". Archived from the original on 28 August 2006. Retrieved 1 June 2017. ^ "Mooloolaba Sea Temperature". seatemperature.org. Archived from the original on 17 January 2018. Retrieved 1 June 2017. ^ "Noosa Heads Sea Temperature". seatemperature.org. Archived from the original on 16 October 2016. Retrieved 1 June 2017. ^ "Sunshine Coast Airport". Climate statistics for Australian locations. Bureau of Meteorology. April 2016. Retrieved 23 April 2016. Wikimedia Commons has media related to Sunshine Coast, Queensland.